La Voz Latina, a Trinity College student-led organization, calls for art projects from Hartford-area students, specifically art forms, physical or digital, representing Hispanic/Latinx cultures. 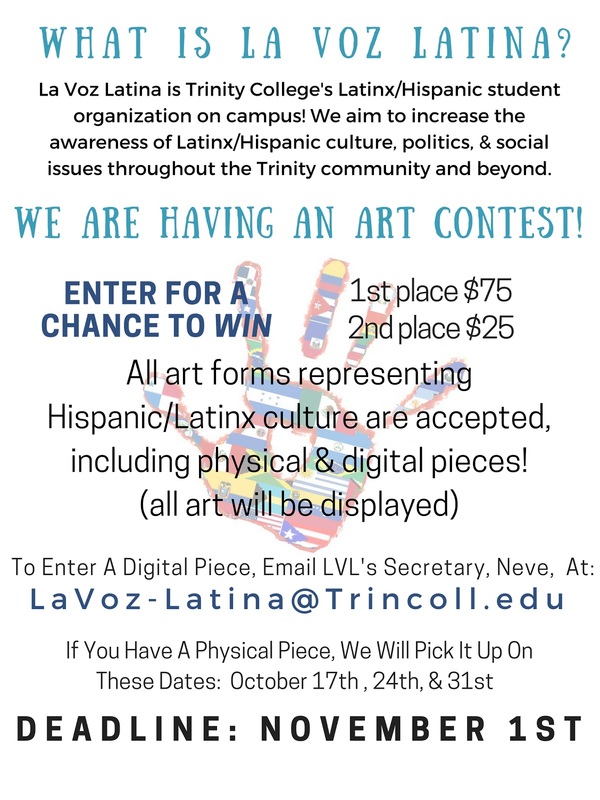 To enter, e-mail LaVoz-Latina@trincoll.edu. The deadline is November 1, 2017. All art will be displayed. La Voz Latina is a club open to all students interested in Hispanic cultures. The purpose of La Voz Latina is to increase the awareness of Latin American culture, politics and social issues in the Trinity community. 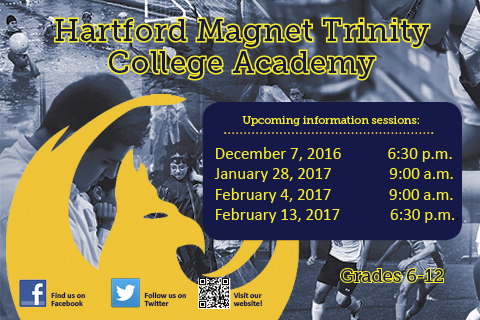 It has a commitment with the Latino community of Hartford in bringing what they can offer to Trinity and its Latino students. Along with other organizations, La Voz Latina provides social and cultural programming needed in the Trinity Community. Join us for a light dinner and a talk with Dr. Daren Graves who will share his story entitled, “Written All Over My Face: A Black Man’s Toll of Teaching White Students About Racism”. The story is featured as a chapter in the recent volume, Confronting Racism in Teacher Education: Counternarratives of Critical Practice. When: Wednesday, June 7 @ 6 p.m.
Who: Open to the public. 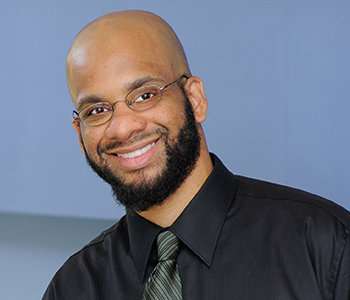 Daren Graves is currently the director of the Urban Master’s Program at Simmons College. As a teacher educator, he is committed to preparing teachers who see urban youth as assets in the teaching and learning process. His research interest involves the interplay of school culture and racial identity on the academic performance of Black adolescents. Graves’ research has given him an understanding of the issues that Boston-area youth face inside and outside of their school environments. Graves previously served as Assistant Director at Simmons College Upward Bound in Boston, where he helped coordinate the academic and college preparation components of this federally funded after-school and summer program. 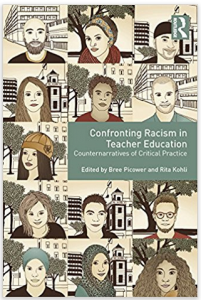 Confronting Racism in Teacher Education aims to transform systematic and persistent racism through in-depth analyses of racial justice struggles and strategies in teacher education. By bringing together counternarratives of critical teacher educators, the editors of this volume present key insights from both individual and collective experiences of advancing racial justice. Written for teacher educators, higher education administrators, policy makers, and others concerned with issues of race, the book is comprised of four parts that each represent a distinct perspective on the struggle for racial justice: contributors reflect on their experiences working as educators of Color to transform the culture of predominately White institutions, navigating the challenges of whiteness within teacher education, building transformational bridges within classrooms, and training current and inservice teachers through concrete models of racial justice. By bringing together these often individualized experiences, Confronting Racism in Teacher Education reveals larger patterns that emerge of institutional racism in teacher education, and the strategies that can inspire resistance. 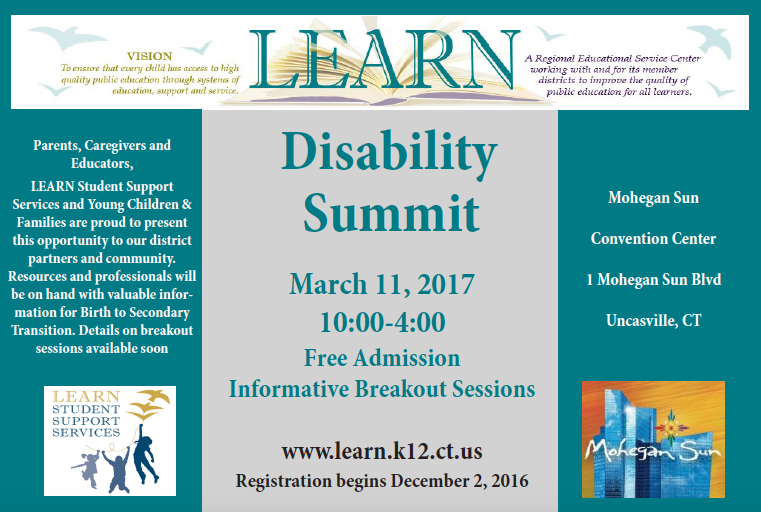 The Disability Summit will be held on Saturday, March 11 at the Mohegan Sun Convention Center from 10:00am-4:00pm. 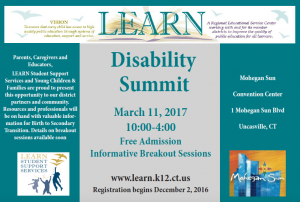 This event is free and open to all families/caregivers of children with disabilities, students, and professionals who support students with disabilities from birth to age 21. December 7 @ 6:30 p.m.
Saturday, January 28 @ 9:00 a.m.
Saturday, February 4 @ 9:00 a.m.
Monday, February 13 @ 6:30 p.m.
“Feminism, Radicalism, and Social Movements”, Tuesday, November 15th @ 4:15 pm, Trinity College, Reese Room. When: Friday, September 16, 2016, 6 p.m. – 12 a.m.
Where: Four Points Sheraton Hotel, 275 Research Parkway, Meriden, CT. Get directions here. 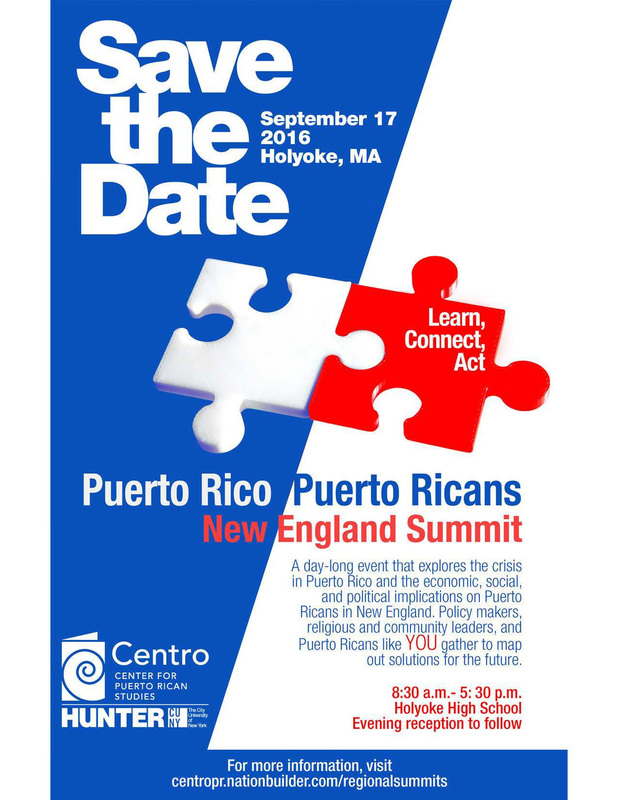 Contact: Marilyn Calderon at (203) 980-8511 or marilyn@ctparentpower.org if you have any questions. Buy a ticket using this form. Become a sponsor using this form. This fourth annual event is an opportunity to help support our statewide co-created vision entitled: ALL-IN CT Equity4Change that fosters engagement, education, and mobilization of diverse parents and partners who are passionate about children’s preventive issues to gain the knowledge on what is happening at the local and statewide levels to make informed decision by developing and maintaining linkages with stakeholders who work hand in hand to find solution based thinking and action steps to end poverty and racism with better health, safety, equity and wellness for all children through collective action. 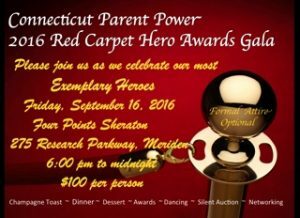 Connecticut Parent Power (CTPP), established in 2001, is one of the state’s largest parent volunteer organizations. CTPP focuses on local, state and global affairs with issues that include, but are not limited to early childhood, (cradle to career) education Pre-K thru 12th grade school systems, immigration/racial/equity/economic security and health care reform. What: Puerto Rico, Puerto Ricans New England will bring together key members of the Puerto Rican diaspora in New England and their allies to examine and gain a broader understanding of how the economic, fiscal, and unfolding humanitarian crisis in Puerto Rico has impacted the stateside Puerto Rican community. This event is free for all and open to students as well! When: September 17, 2016 at 8:30am – 5:30pm. The summit will start with a continental breakfast at 8:30 a.m., and the program will start promptly at 9:00 a.m.
Betty Medina Lichtenstein, Executive Director, Enlace de Familias, Inc.
Gretchen Sierra-Zorita, Project Director, Media Diversity Initiatives for the National Hispanic Foundation for the Arts, Washington, D.C.
Moderator: Nilda Ruiz, President and CEO, Asociación Puertorriqueños en Marcha, Inc.
Moderator: Juan González, Esq., San Juan Bautista Parade, Inc. Sergeant Gumersindo Gómez, Executive Director, Bilingual Veterans Outreach Centers of Mass. Inc.
4:15 P.M. PLENARY PANEL: WRAP-UP PLENARY: WHAT HAVE WE LEARNED, WHERE DO WE GO FROM HERE? Dr. Edwin Meléndez, Director, Center for Puerto Rican Studies and Betty Medina Lichtenstein, Executive Director, Enlace de Familias, Inc. Separate and Unequal: How Do We Achieve Equity in Education? Though it has been more than 60 years since the Brown v. Board of Education decision ordered schools to desegregate, our educational institutions are still separate and unequal. How do we create equity in education? How do we ensure everyone has the resources to succeed? Join the conversation with featured guests Jose Colon, Hartford Public High School and Robert Cotto, Trinity College and Hartford Board of Education. What happens at a Salon? Since 2008, the Stowe Center has brought community members together for Salons at Stowe, spirited discussions of contemporary issues to foster engagement and community action. Salon admission is FREE thanks to our members, donors and CT Department of Economic & Community Development; CT Office of the Arts; Ensworth Charitable Trust; Greater Hartford Arts Council; Hartford Foundation for Public Giving; The Hartford; Lincoln Financial Foundation; and Travelers Foundation.